Fairport, NY: Saelig Company, Inc. has introduced the Hioki CM4141 and CM4142 AC Clamp Meters which are rated for use with currents up to 2000A. These new current sensors feature a unique compact, sturdy jaw design for easy application around existing wiring, robust enough to push and pull wiring. The CM4141 and CM4142 deliver accurate results even when measuring AC current waveforms that have been distorted by inverters or switching power supplies. Three 'true RMS' ranges (60/600/2000A) suit a wide range of applications. Multiple parameters can be measured, including AC current, AC/DC voltage, frequency, continuity, resistance, capacitance, diode, and temperature. The CM4141/CM4142 is more than 100g lighter than a conventional clamp meter of the same size. The CM4141/4142's jaw shape allows it to be safely and easily routed around closely packed thick, high-current cables. They can measure cables with a diameter of up to 55mm, providing the ability to measure even thick cables without needing to connect an additional flexible sensor. The CM4142 model also incorporates Bluetooth® wireless technology, enabling Hioki's free smartphone app Gennect Cross to be used to transfer the measured values directly from the CM4142 to a smartphone. In addition to the ability to create simple PDF reports, the app can save data as a CSV file for later analysis. Regular maintenance and management are essential in order to keep electrical equipment operating properly in buildings and manufacturing plants. Clamp meters make it easy to measure current flow simply by clamping the jaws of the instrument around the cable being measured, and as a result they have become widely used in maintenance management situations. Building & plant maintenance, etc. Designed and manufactured by Japan-based Hioki, a world-renowned developer and manufacturer of innovative test and measurement instruments, the CM4141 and CM4142 AC Clamp Meters are available now from Saelig Company, Inc. their USA technical distributor. For detailed specifications, free technical assistance, or additional information, please contact Saelig 888-7SAELIG, via email: info@saelig.com, or visit www.saelig.com. Electrochemical Instrument test energy storage devices. Portable Picoammeter measures very low DC curents. DC Ammeter features built-in 20 mV shunts. 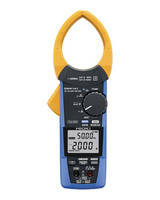 Analog Panel Meters measure 1.54 x 2.95 in.